The Obama administration is drafting an executive order that would give the US president the power to arrest without charge, and imprison indefinitely without trial, foreign nationals it accuses of being terrorists, according to several senior government officials who spoke with the Washington Post and a reporter for non-profit news source ProPublica on condition of anonymity. The order, should it be released, would likely reuse arguments made by the previous administration of George W. Bush that the laws of war allow the executive branch to disregard the established judicial system and domestic laws and rights, such as those guaranteed in the Bill of Rights. 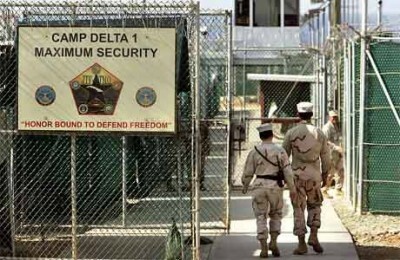 The Obama administration hopes an executive order will resolve the legal fate of the 229 remaining Guantánamo prisoners—as well as future prisoners in the “war on terror”—by allowing the president to incarcerate them indefinitely, likely at military installations in the US. According to the Post, the administration believes that Congress will be unable to develop satisfactory legislation, and that the proposal for a national security court would open up rifts within the Democratic congressional caucus. One official told the Post that the administration fears that Congress will assert too much control over any new legal system by subjecting the president’s ability to move detainees to legislative review. Nonetheless, negotiations between administration lawyers and top Congressional leaders are ongoing. The Obama administration has concluded that trials in the US court system can be used for only a handful of the prisoners. This is because, in the first place, the great majority of the Guantánamo inmates are innocent of any relationship to Al-Qaeda or the Taliban. Second, what “evidence” there exists against them has been extracted through torture, or dubious forms of hearsay evidence gathered by secret agents or foreign spies who cannot appear in court. Third, civilian trials could bring into public focus and place before judicial scrutiny the criminal methods Washington has used in the war on terror—including torture and kidnapping—and perhaps place in legal jeopardy CIA agents and former Bush administration officials. The only name so far broached for a possible civilian trial is Khaled Sheik Mohammed, who is accused of being an organizer of the September 11, 2001 terror attacks. The administration claims that, among Guantánamo detainees, three other inmates are also linked to the attacks. This is in itself a damning admission. Of the hundreds of inmates who have been held at Guantánamo, many of them tortured, only four are alleged to have any connection to the act of terrorism that has, for eight years, been the catch-all justification for the “war on terror,” and indeed for the Guantánamo prison camp itself. Military tribunals are apparently an increasingly unattractive alternative to the Obama administration as well. On May 15, Obama announced his intention to restart military commission trials for some Guantánamo inmates that would allow the use of hearsay evidence against the accused, and which would make only cosmetic alterations to the tribunal system used under the Bush administration. Yet out of the nearly 800 inmates who have been held at Guantánamo since 2001, only two have so far been convicted by military tribunals—Australian David Hicks and Salim Hamdan, Osama bin Laden’s chauffeur. Hicks’ conviction resulted from a plea deal and he was soon released to Australia. Hamdan—a hand-picked test case of the tribunal system—was given a light sentence by a vetted military jury, in what was widely considered a major rebuke to the Bush administration. A third option—releasing a small number of clearly innocent Guantánamo prisoners into the US—has been all but scrapped. Obama and leading Democrats have determined this is politically unviable, after Republicans raised a hysterical campaign over the supposed dangers of bringing “hardened terrorists” to the US. Finally, Obama’s persistent appeals to foreign governments have, with few exceptions, been rejected. Foreign capitals argue that if the prisoners are too dangerous for release in the US, they will face political backlash for accepting them. The Post offers as an example Walid bin Attash, who is accused of participating in the attack on the USS Cole in 2000. The evidence against Attash reportedly cannot stand scrutiny before either a domestic court or military tribunal. Crucial evidence in the government’s case against him was extracted through the torture of another prisoner, Abd al-Rahim al-Nashiri, and two other supposed witnesses cannot appear in court. On June 22 US federal judge Richard Leon issued an emphatic ruling against the Obama administration in the case of Abdul Rahim al Janko, who has been held at Guantánamo for seven and a half years, highlighting the legal difficulties it faces in prosecuting “terror suspects” in civilian courts. Leon ordered the immediate release of al Janko, now 31, a Syrian national of Kurdish background. Leon ruled that the Obama administration had not proven, even on a lenient “preponderance of the evidence” basis, that al Janko could be lawfully held any longer. While the Obama Justice Department dropped the Bush administration’s use of the term “enemy combatant,” it offered the court the same argument—that the president can indefinitely hold terror suspects through the Congressional Authorization for Use of Military Force (AUMF), which was passed three days after the September 11 attacks. In his ruling, Leon noted that whether or not the Obama administration cares to use the term “enemy combatant,” in practice its policy is the same. Tragically, al Janko had been imprisoned and tortured for two years by the Taliban, who accused him of being a US spy, before the US seized him and subjected him to a much longer duration of imprisonment and torture—accusing him of being an Al-Qaeda terrorist. The Post article is itself part of an attempt by the administration to gauge political support in Congress and the military-intelligence apparatus for such an executive order. “One administration official suggested the White House was already trying to build support for an executive order,” the article notes. This is keeping with the modus operandi of the Obama administration. Prior to making several policy moves over the past few months related to Guantánamo, top “anonymous” officials “familiar with the matter” have planted stories either in the Post or the New York Times in an attempt to prepare a Congressional consensus. Obama’s victory in last year’s election, it must be recalled, was owing in large measure to a shift behind his candidacy among powerful elements in the military and foreign policy elite who felt that the Bush administration’s handling of “the war on terror” had damaged the international standing of US imperialism. At the same time, Obama won millions of votes of those disgusted with the police-state policies of the Bush administration. Now, only five months into his administration, Obama has cast aside all of his promises to curb the new anti-democratic powers of the state. Obama has promised there will be no investigation, let alone prosecution, of Bush administration officials or CIA agents who ordered or carried out torture, and has moved to block from public view further evidence of prisoner abuse. Invoking the “state secrets” doctrine, the Obama administration has maneuvered to shut down civil court cases of those who were abducted and tortured in the war on terror. And the National Security Agency, it has been revealed, continues to monitor the e-mail communications of millions of US citizens, even as the Obama administration moves to establish a military “Cyber Command” that would have new authority over the nation’s computer networks. Obama’s increasingly open embrace of all the anti-democratic methods of the Bush administration—with even superficial differences vanishing—demonstrates the impossibility of defending democratic rights through one or another capitalist politician or party. The criminal methods of the “war on terror” arise not from the mistaken policies of individual politicians. Rather they arise inexorably from the deeper criminal act of launching wars of aggression, which in turn arises from the US political elite’s drive to offset the decline of US capitalism by seizing critical natural resources and strategic advantage over its main imperialist rivals in Europe and Asia.